I wanted to elicit some help from my fellow bloggers and dividend growth investors on an issue that's been bothering me, especially in the current market environment. So thanks in advance to everyone. I happened to miss the dip in price on several high quality companies such as Coca-Cola and Proctor & Gamble early Monday morning and therefore didn't get to purchase any shares. Although I would have purchased had I set my limit orders the night before. Being a dividend growth and value investor, I'm always conscious of trying to pay fair value and usually less with an additional margin of safety built in to my purchase price when I analyze a company. While I believe that valuation is a key driver to determining your future returns, I find myself perplexed in the current market. Most of the dividend champion stalwarts are trading above fair value and in a lot of cases by a considerable level. 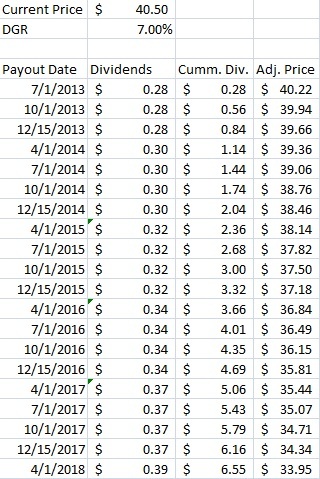 So I'm left with the option of building cash or investing with sub-par future total return possibilities. While I'm fine with building cash to a certain extent, I'm in the lucky situation with about $4,000 is the least I'll save each month that is specifically earmarked to invest, so that cash builds really quick. So if I wanted to continue to invest in the current market I would focus solely on quality. That's enough rambling for now. I guess the issue is, say through my analysis I determine that I will pay no more than $40.50 per share of Coca-Cola. That's great and all, but KO closed trading yesterday at $41.43. What if the share price never falls below $40.50 and you can't purchase the shares? The adjusted purchase price is to account for the missed dividends while waiting to purchase the shares. Or simply Adj. Price = Target Price - Cumm. Dividends. If I miss just one payment, then I would need to drop my purchase price down to $40.22 to have the same value as if I had purchased at $40.50. Miss a years worth of payments and the adjusted price drops to $39.36. 2 years? $38.14. 5 years? $33.95. Here's how it works out if you start with the recent close price of $41.43. It would take essentially 3 dividend payments to get your adjusted price down to the level you wanted to purchase at anyways. Two years of payments and you'd have an adjusted price of $39.07. Now I know a lot of this assumes that there's not more compelling valuations in some other truly great companies. And it's not like I'm a great predictor of what's to come with the markets. I've been sitting mostly on the sidelines since about February. Guess I was a bit early on that one. And if you believe that in the long term, total returns can be estimated by Yield + Dividend Growth Rate, then it's not like Coca-Cola is really going to offer that bad of returns. With a current yield of 2.70% and estimated dividend growth rate of 7%, you'd be looking at 9.70% total returns. No complaints there. With the transfer of May's savings to my brokerage account, I'm now sitting on over $19k in cash waiting to be put to use. That's around 19% of my approximately $100k portfolio's invested value (i.e. excluding cash). While some of this cash is spoken for to cover the margin requirements for my open puts and I wouldn't be comfortable trying to get it all invested since some of my puts are currently in the money, meaning I'd be forced to purchase shares upon expiration. How should one go forward in a market that seems to be in general on the high side? I don't want to expose too much cash to some of the possibly lower quality companies or companies that don't have an established history of growing their dividend, even if they're at better valuations. In the event of a huge slide in the markets or another turn in the economy, the high quality companies will remain in tact. I can't really imagine a scenario where Coca-Cola, Proctor & Gamble, Johnson & Johnson or ExxonMobil go out of business without the whole country falling apart. Of course, your cash would be more useful as toilet paper in that scenario. I guess the question boils down to what level of cash, if any, would you consider to be enough before you'd start making purchases despite the higher valuations? And do you think dollar cost averaging into the stalwarts with the extra cash is a good idea even though valuations are on the high side? Instead of keeping cash, I usually invest temporarily my money in an equity index. My goal is to have 100% of my portfolio in equity. Therefore, if I don't find what I'm looking and I have 10% of my portfolio sitting in cash, I'm leaving money on the table. Instead, I buy an equity index which allow me to benefit from the stock market and a great diversification until I find the next stock I want to purchase. For example, I'm +12% with my equity index right now (I only have $800 invested). But I would have made about 1% if I had left it in a money market fund. I think I'd prefer to not use an equity index just because the whole point of keeping the cash was to preserve the buying power. If it's invested and there's a broad market selloff that finally gives the opportunity to purchases the companies I'm interested in, well now I'm buying with less capital. My usual plan is to be about 90% invested which I'm probably pretty close to that if you back out the open puts that I have, especially since one of them will probably get executed. 2) The DCA vs waiting for your fair value - This is a tougher one for me. I can't really even give an opinion, but the difference between $40.50 and $41.16 on KO even on a $5,000 purchase is about 3 extra shares....are 3 shares worth a pop in the stock price? Don't know. I am very fortunate to be able to save and invest a good chunk every month. So it's really helping to build up the portfolio. (1) I look for stability and predictability of their revenues and cash flows and in turn the potential for increased dividends. I have a good mix of those with 25+ years of increases as well as some between 10 and 25 and less than 10. So as long as I can make a case without being overly optimistic of the company generating more profits the following year, that's what I consider quality. (2) This actually is one of the things that I get stuck on. It makes complete sense when I think about it but when I go through my analysis I always seem to get hung up on the price points. In the long run those 3 extra shares probably won't make a difference, especially since there's no telling if the price will actually come down to let you purchase. If it ends up taking years to come down you've missed out on a lot of compounding. Although, once again, this is assuming there's no other companies trading at attractive valuations. My strategy has been to try and find the best valued thing out there each month or so as capital hits my account. I'm not saying this is the best strategy, but since I don't know the future it makes sense to me. I just bought CVX. It wasn't at my ideal valuation - but it was pretty fairly valued. In the long run I think everything will average out. I wouldn't grossly overpay for a company, but I don't know if it's worth waiting for the absolute lowest price. IMHO, a stock is either near enough to fair value to be worth buying or move on and look for something else. I'm not a big fan of sitting on piles of idle cash. I do the same thing, which is one reason why I don't use DRIP for my dividends. I like to research undervalued companies every month. It's a bit more work but I don't mind, for me it's actually fun. Is that crazy ? Grats in CVX by the way. I just missed that ex-div date so I'll have to wait till next quarter if I still think it's a good value. I try to get most of my capital invested quickly, of course part of that had to do with the opportunities when I was first starting. My buy list was about 20 deep with them all being at attractive prices, not so much with the run-up so far this year. My cash pile tends to get funneled towards selling puts when I don't see all that attractive of purchases. I think I need to start loosening my price points a bit. I just get hung up on my calculations, but I need to remember that my calculations aren't infallible. There's too many factors that can change the business. I would rather sit on cash than overpay for a stock. However, if you're really anxious about not missing opportunities and cannot find any undervalued stocks, then here's one approach you could take: At the start of each month, rank the stocks on your watch list from best to worst valuation, then buy some shares of the most highly ranked stock. You mentioned having around $4K in new capital to invest each month, so maybe the purchase could be around $4K. That way you'll be putting money to work each month, but at the same time you'll have a good-sized chunk of cash (your remaining $19K) for potential use in the event of a major market downturn that brings about some undervalued opportunities. I think somewhere between $10-20k is going to be my limit. At that point that leaves plenty of cash for me to sell some puts as well as have cash left over for strategic purposes. And then just invest the new savings no matter what. I'm not really sure why this has been causing me so much frustration, but it has. It's one of those situations where you know the principles and if someone came and asked me for advice on the subject I'd probably tell them exactly what you told me. But since it's my cash and savings, I'm treating it differently. Well today's sell off took KO down to $40.65, so maybe you won't have such a problem on your hands after all ;) Really though, I've been having the same thoughts. I don't like sitting around accumulating cash, but most of the stocks I like are just trading too high for my liking these days. I've been sitting on the sidelines, but if we get some more dips like we've seen the past few days I'll cautiously look to pick up some shares here and there rather than making any big moves. I noticed the drop in KO, although it happened right after I purchased at $41.11. So note to any readers, follow my twitter account and you can probably purchase the same stocks I do for cheaper about an hour later. I really dislike having cash just pile up, although it does let me use put options easier without being overleveraged. There's still plenty of companies I'd love to invest in that aren't trading at ridiculous valuations but they aren't quite where I'd like so the cash has been on the sidelines. More dips are always welcome from me. Good post. In my beginnings, I missed out on a few opportunities because I didn't have the cash. But this year, I made purchases I wouldn't have necessarily made because I had too much cash. I thought CVS, CSX, BAX and IFC.TSX were fairly valued whereas CAT, DE, LNF.TSX and BNS.TSX were slightly overvalued. Since January 2013, I have invested $32,488 in these stocks and still have over 20k in cash. It's not an easy decision. Right now I'm contemplating purchasing 100 shares of Telus (T.TSX) even though I know it isn't cheap; if I don't do something, I'll be up to 24k in cash at the end of the month. For me, 20k in cash gives me the flexibility to cease opportunity (e.g. JPM last year, market downturn). I'm getting to the point where too much cash is becoming a problem. I'm going to start investing my new savings each month no matter what, so it'll be to whatever I feel is most in line with it's value. The cash I currently have is still plenty to take advantage of special situations, like JPM last year or WMT in late 2011. I've never had a cash allocation (19%) that high, so it's hard for me to compare my own situation. While I like to have a few grand in spare cash sitting in my checking account at any given time, I like to have most of my capital working for me. However, it's tough to continue to invest in a market that has run up so fast so quick. I think it comes down to looking less at today's prices, and instead imagining the prices that you'll see 10, 20 or 30 years down the road. While I'm not extremely excited to part with my comparatively small cash balance (currently around $3k) I continue to try and swing at the best values I can find until we start to see an occasional "fat pitch". I prefer to not have this high an allocation to cash but as I've mentioned some is spoken for to cover some option positions. You bring up a good point about looking ahead 10+ years to the prices then. Is overpaying by $0.50 per share really going to make that big of a difference? Especially if your focus is on the income stream and it's growth? As Evan mentioned above, it's not like there's a huge difference between the number of shares purchased at $40.50 rather than at $41.15. But there's a big difference between not getting invested and being invested. Time in the market and all. This is relevant to me as well. I have 9 grand sitting around collecting dust, paying maybe 10 cents interest per month. I decided I'm done accumulating cash. I'm going to invest my monthly deposit + dividends regardless. I'll try to find something moderately undervalued. If not I'm going quality with the best of the best, a name I can trust. I'd like to step up my stake in KO, JNJ, and CVX. Also initiate XOM. I'd probably look there first. I think you have to draw a line in the sand and say, okay that's enough cash. New money needs to get invested no matter what. That level will be different for every investor but I think it's important to have a line drawn. It's not like we get bargain basement 2009 opportunities all that often so cash is a losing prospect to me. Sticking with super high quality seems the best route because there's always value in quality. I need to initiate a position in XOM but the low starting yield keeps tripping me up. Another dip below $90 and I'll go on and start my position. I'm looking for CVX below $120 preferably around $118 and JNJ below $80. In 30-40 years I think we'll both be pleased with the dividends from any of these companies.